FYFI: Highest calories meals, when to eat them! When it comes to fat burning and weight loss I always recommend keeping it simple. First, let’s start by removing the constraints of breakfast, lunch and dinner. I for one hardly ever eat “breakfast” in the morning and by the time I finish my day “dinner” is out of the question as well because its too late. Instead let’s focus on 1st meal, 2nd meal and 3rd meal. We will then make the 1st meal our largest meal, the 2nd meal is lighter than the 1st and the 3rd meal is the lightest. 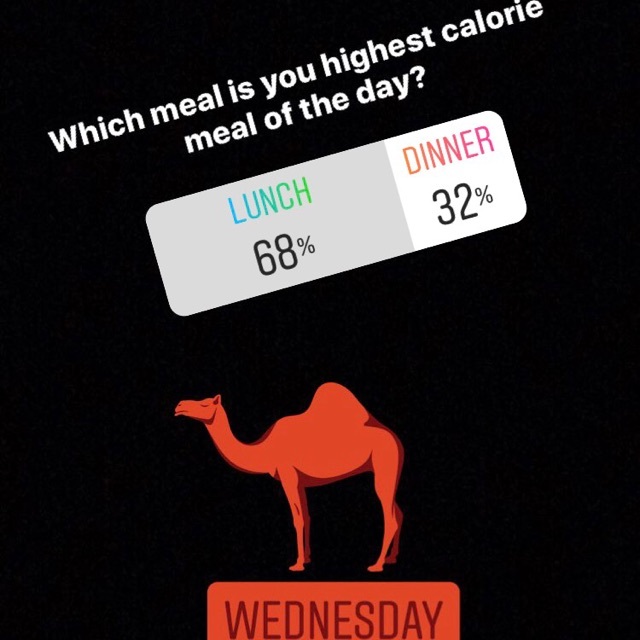 For example, if you are consuming 1500 calories a day (by the way if your goal is to lose weight and/or burn body fat to be successful you must know if you are meeting the daily number of calories required to do so) the 1st meal can consist of 750 calories, the 2nd meal will be 450 calories and the 3rd…300 calories. This method sets your day up perfectly. Many of us require the greatest amount of energy at the start of our day so we need lots of calories to power us through. By the time we eat our 2nd meal it is time for a recharge. The third meal pulls everything together ensuring we meet the daily amount of calories required to achieve our goals. Also, try to eat that 3rd meal no less than two hours before bed. This will provide time for most of the food to properly digest allowing for a good nights rest but more importantly once the stomach is empty of food the body then enters a fasting stage. It is in this stage where the body repairs itself, burns body fat and allows us to also shed those unwanted pounds. A major key to fat burning and weight loss is that you try not to overthink it. If you need help simplifying the process never hesitate to ask a health and wellness professional. We are here to help. The smallest amount of advice/information could be what is standing in the way of you reaching your goals. Thank you Zee for the share and for your support of the annual Sweat Shop party! If you see him on the dance floor Oct 28th don’t hesitate to say hello! « We do it big in a small way!